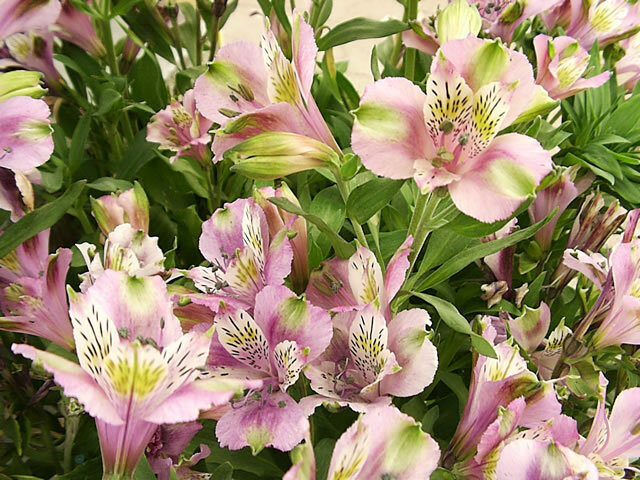 Peruvian Lily plants are tuberous rooted perennials with bright green, lance shaped foliage that grow 2-3 feet tall. They produce loose clusters of speckled, 1½"-2" Azalea-like flowers on long, leafy stems in late spring into mid summer. Alstroemerias are low maintenance, long lived plants that are prized for their usability in cut flower bouquets. and brought back to Europe where botanists quickly began to experiment and create new hybrid cultivars. Most commonly available Peruvian Lilies are hybrids of Alstroemeria aurea, A. ligtu or A. chiliensis. Peruvian Lily plants are hardy in USDA zones 7-10. They should be grown in full sun except in hot summer regions, where they will do fine in light shade. Peruvian Lilies should be grown in rich, light, slightly acidic soil. Prepare the planting hole by adding generous amounts of compost and peat moss to the soil along with coarse builders sand for added drainage. 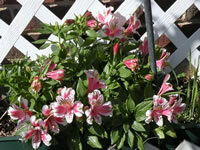 Alstroemeria tubers should be planted 6"-8" deep, using care not to damage their brittle roots. Water regularly and thoroughly to keep the soil evenly moist. In cold winter regions, apply a heavy mulch of peat moss or dry leaves in the fall. Top-dress with well rotted manure or compost as soon as new growth begins each spring. and stored in some damp potting soil and kept in a cool, dark area. if you can provide them with a cool space and sufficient sun. Water regularly, but be careful not to over-water. Reduce watering in the winter months. Feed every 2-3 weeks when in bloom, using a ½ strength solution of a soluble, bloom type fertilizer. 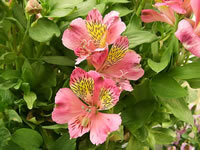 Cutting Alstroemeria flowers will slow the growth of the plant. a few inches from the ground and twist it as you pull it upward. This will detach the flower cleanly from the rhizome and promote heavier flower production. Alstroemerias should be left undisturbed for as long as possible before digging and dividing them because they will take 2 or 3 seasons to re-establish themselves after transplanting. They should only be divided in early spring. 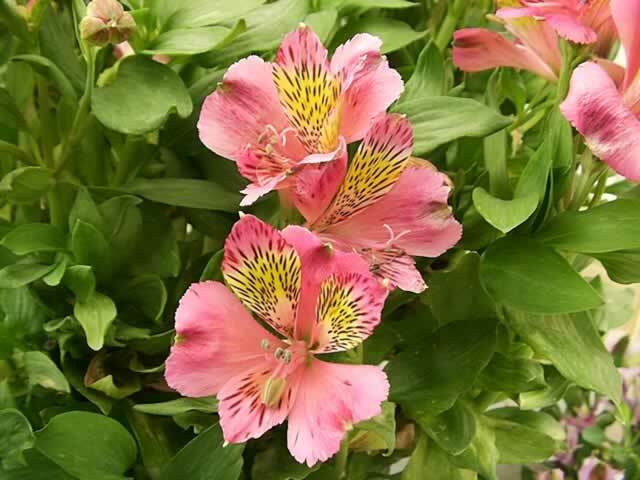 Alstroemeria seeds can be planted directly into the garden in early spring, once the temperature reaches about 40°. In mild wither regions, they should be planted in the fall. Sow seeds indoors in late winter. Maintain a soil temperature of 55° until germination, which takes 15-20 days. Once the seedlings are 5"-6" tall, give them a light feeding of a slow release fertilizer. Thank you for the use of your (center) photo, Diane!